* Originally posted on June 15, 2011. The Foundation for Economic Freedom (FEF) has produced a new statement, Manifesto Against Increases in Power Rates to Subsidize Solar and Wind Energy Producers and to Guarantee their Superprofits. Portions of it below. Click to get a larger image. I am not exactly a fan of the FEF, but on certain issues, I support their campaigns. Like this one, to expose the racket and legalized robbery in the Renewable Energy (RE) law, where we, ordinary energy consumers in the Philippines, will be forced to pay even higher electricity rates to the already high rates, to subsidize the RE power plants of the new energy cronies. We believe that the subsidy in the form of Feed-in-Tariff rates should NOT be given to existing power producers as this will mean a tremendous windfall for them. These producers are already enjoying tax and duty free incentives and will not add to the nation’s power supply. 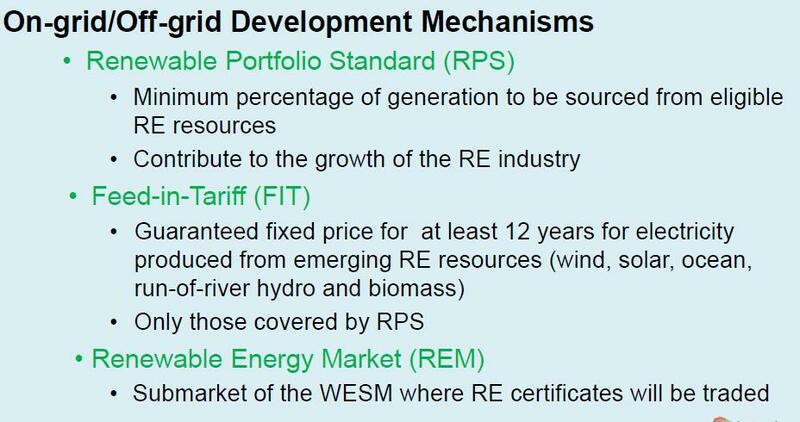 I think it’s already late for the FEF and the public to complain about the Feed-in-Tariff (FIT) system. It’s already in the law. The strong RE lobby, led then by the World Wide Fund (WWF), Greenpeace and other climate alarmist groups, made sure that the new energy cronies will get such incentive in order to help “save the planet.” Those lobbyists for RE cronyism will insist that the law should be implemented. But if public pressure to set aside the FIT provision will be strong as it will mean even more expensive electricity rates, perhaps the RE producers and cronies will be ashamed to push for it. It’s a good fight worth pursuing. Once people fall for climate alarmism and the various racket and rent-seeking provisions, regulations and taxation that the alarmists and governments want, they’re trapped. It just happened that a number of the FEF Fellows and members are part of the climate alarmism movement. Meanwhile, here’s another article from Boo Chanco today. Beyond the subsidy called Feed-in Tariff, there are other things that ought to be looked at before we agree to allow them to put additional burdens on our power users. For instance, it is not clear, the position paper of the Foundation for Economic Freedom (FEF) observes, what is it exactly that the envisioned FIT program is supposed to buy us? 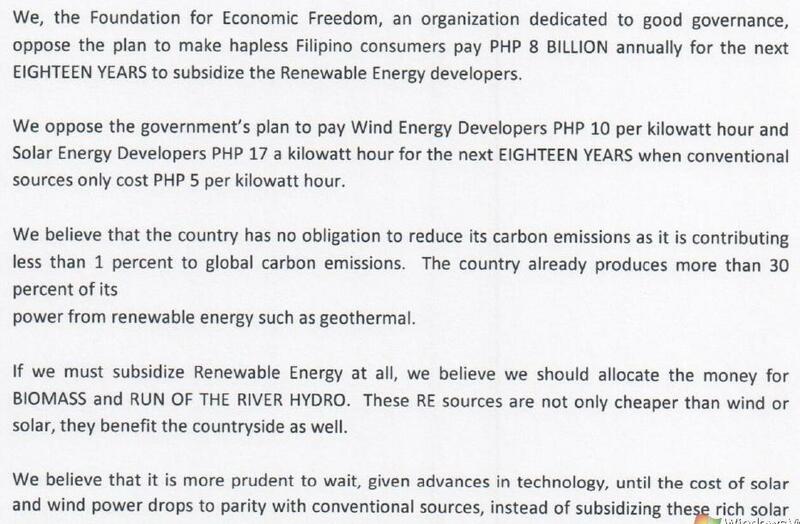 Romy Bernardo who spearheaded the paper’s drafting illustrates: The subsidy cost for solar per kWh is over P12. (calculated as the FIT rate of P17.95 less avoided cost of P4.50/kwh or the cost of buying at the current grid cost). One can lower consumption of power by giving away new efficient light bulbs that produce 60 watts of brightness at 15 watts use of power. Based on the calculation, by an ADB expert, the cost of doing this translates to $0.025 per kWh saved, roughly ten centavos/kWh saved. The numbers are striking– P12 solar vs. P0.10 for energy efficient light bulbs. In short, just give free light bulbs and you can do more than 100 times the benefit in terms of reducing carbon footprint for the same peso spent from public purse. A slightly clever solar operator selling at FiT rates can put solar panels under a light bulb, run even when there is no sunlight (like even night time) to get paid for power at P 17.95 per kWh, and only incur cost of P4.50 per kWh to buy power from the grid for the light bulbs.